A big thanks to everyone who entered last months competition! Since there were so many wonderful designs to choose from, we decided to let our Facebook followers pick the top 3. Using a high density sponge, lay down a base of Diamond FX dark blue and Diamond FX light blue going back over with the first color to give it a smooth blend. Then, using a 1” flat brush, sweep Tag pearl silver over the entire eyelid and bring it under the eye as well as to a point in the inner corner. Using a 1” dauber sponge and Tag pearl silver, create a shimmery background for your snowflakes. I placed mine on both of my temples and one between my eyebrows. Next, take a number two round and load it with Diamond FX white to create your snowflakes. I also placed some smaller snowflakes, dots, and swirls to add interest and movement. Add the final touches by placing swirls and dots around the main snowflake on your forehead using Diamond FX white and your number 2 round. 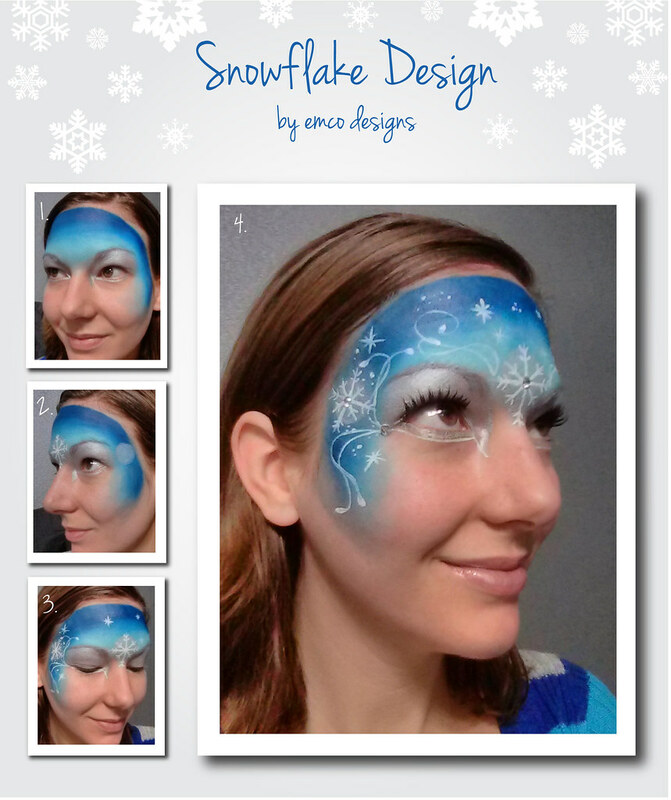 Some optional ways to finish the look are to add jewels in the centers of the snowflakes as well as in the outer corners of the eyes with a glue stick and some fun eyelashes! Thank you once again to all who entered and I look forward to seeing all your beautiful designs in next months competition!